The gallery's default view shows photos grouped based on time. Thumbnails are shown on a clean white background and you can change their size with a pinch zoom gesture. Events uses time and location to group photos and automatically create "Video highlights," a slideshow accompanied with music. You can export that to a video to share on your social network of choice. The Categories view groups multimedia by type - pictures, videos, slow-mo videos, Virtual shots and so on. The People category groups photos based on the faces in them. There's also a Documents category. You can use the Search shortcut to look for photos based on category, people, time, event, location and so on. Batch operations are gone, but you can easily move photos to Private mode (this requires activating the mode). Editing tools include simple things like Auto adjust, crop and rotate, but you can also do collages and go into the Photo editor, which is the usual Android editor with more advanced crop and rotate tools, color adjustment, effects and dedicated portrait enhancements (slim face, large eyes, you get the idea). The Share button allows you to send a photo to a device over DLNA, to a TV using screen mirroring or to a wireless printer. Samsung also has a special feature to send profile photos and high-resolution images to your contacts as a sort of mini social network. For non-Samsung devices, recipients get a link over text message, the link expires after a certain period. Samsung's TouchWiz music player used to be one of the most feature-bloated apps, but the company has done some work to trim the fat. The app looks very clean now, essentially it has just two screens. One lets you browse tracks and playlists, with a dropdown menu to switch between views including Folder view. The Music square is gone. The other screen is the Now playing with album art and a few playback controls. You can transfer playback to a Bluetooth or a DLNA device. SoundAlive has gotten rid of the square view too, now it has two dials - one changes the balance between bass and treble, the other between instrumental and vocals. You can tap the Details button for a manual 7-band equalizer. 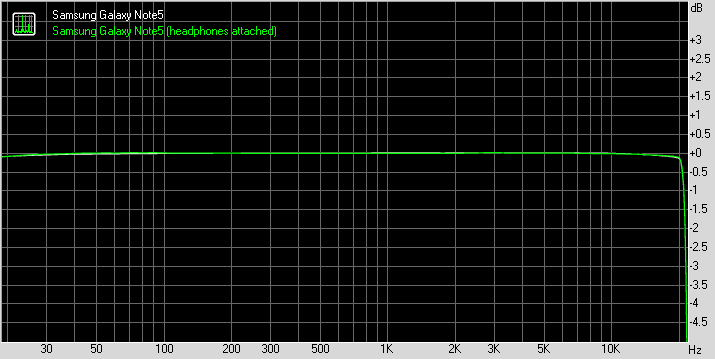 Audiophiles should know 16-bit and 24-bit FLAC audio works out of the box. Adapt Sound is available to automatically tune the equalizer based on your headphones and your hearing. Additional options include SoundAlive+ (creates a surround sound effect) and Tube Amp. There's also Smart volume to balance the volume between tracks and playback speed if you want to slow down or speed up the playback (useful for audio books we guess). One of the most important additions to the audio credentials of Samsung Galaxy Note5 is the UHQ Upscaler. Developed by Samsung, the feature enhances the "sound resolution" of music and video files for better experience with headphones. The video player supports all kinds of video file types and codecs, up to 4K 2160p encoded with the new H.265/HEVC codec. As with most phones though, multi-channel audio (AC-3, DTS) is not supported. The Pop up mode puts the video in a small floating window so you can keep watching while using the phone. There are extensive subtitle settings with adjustable font and text size, text color, edge and background. Multiple presets are available and you can make your own. You can send video files to DLNA players or use screen mirroring. Alternatively you can beam just the audio over Bluetooth, the Play audio only option is useful for music videos - playback continues, while you use the phone as normal. There are built-in video editing options including trimming, video color effects and adding background music (with sliders to control the audio volume from both the video and the background music). A more advanced video editor can be downloaded. It can assemble multiple videos and audio tracks together. 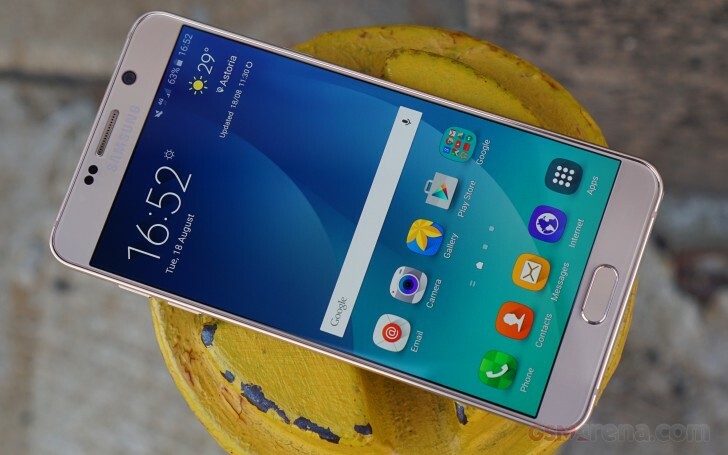 The Samsung Galaxy Note5 is yet another member of the series to deliver seriously impressive audio output. The phablet downright crushed the first part of our test mixing very loud output with impeccable quality – nothing to frown at really. More impressively, plugging in a pair of headphones caused next to no distortion – even the hike in stereo crosstalk was virtually unnoticeable. An impressive showing even for the high end class and one that we wouldn’t call perfect only because the volume levels dropped from very high to just above average. And here go the results.